Colonel Crawford Superintendent Todd Martin talks about the new high school wing at the school. The new wing, currently under construction, is slated to be open to students in November. Work is moving forward on the completion of the Colonel Crawford’s new high school wing, which is slated to be open to students in November. The district is adding a new wing to the northwest corner of the existing K-8 building, putting all grade levels in the same building. 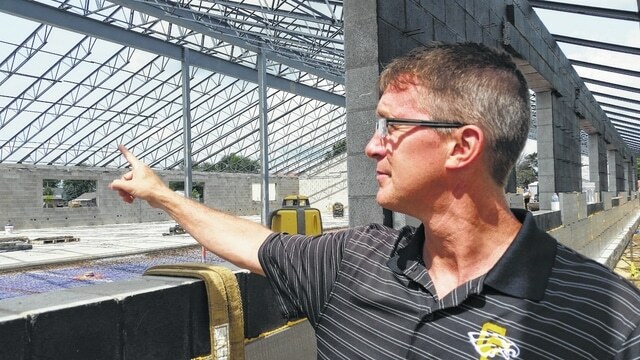 Project officials said when the K-8 building was constructed, there was a special expansion joint created where the high school wing will be attached. A concrete walkway will connect the intermediate wing to the the southern corner of the high school, which will consist of an interior hallway flanked by nine classrooms and a teacher workroom. Colonel Crawford Superintendent Todd Martin said the nine classrooms that are part of the project will be used for science, math and language arts. Work at the school is being conducted by Studer-Obringer of New Washington. Martin said the project will create K-3, 4-6, 7-9 and 10-12 sections at the school district. “This will make full use of our classrooms,” he said. And the district needs the room. Martin said that the district has a total open enrollment figure of 275 students, the highest number that the district has experienced.